Join the Read-To-Cure Challenge 2014! Join the 2018 Read‑To‑Cure Challenge! The 2018 ABC Reading Eggs Read‑To‑Cure Challenge is running from 7 August to 4 September 2018.
one golden egg at a time! 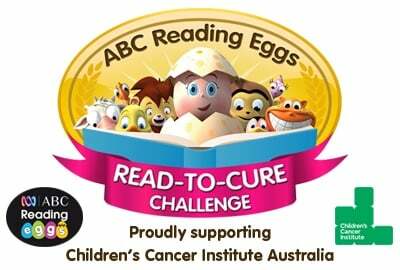 From 4 August to 1 September 2014 your child can take part in the ABC Reading Eggs Read-To-Cure Challenge, and join thousands of kids across Australia reading to raise over $100,000 for the Children’s Cancer Institute. ABC Reading Eggs will provide 5 WEEKS FREE ACCESS to the ABC Reading Eggs program for your child to complete as many books and online reading lessons as they can to help raise funds for childhood cancer research. Family and friends can sponsor their reading efforts and children will have a chance to WIN some exciting prizes, including 16GB Apple iPad minis with Wi-Fi, Toys R Us and JB Hi Fi gift vouchers and Hoyts Family Movie Passes! PLUS!The first 200 people who register for the Challenge and link their fundraising page with their Facebook* will receive a $50 donation from ABC Reading Eggs to go towards their fundraising efforts and help achieve their target. By linking your fundraising page to your Facebook, you make it easy to generate awareness for your cause and fundraising efforts! Children’s Cancer Institute conducts vital medical research into finding a cure for childhood cancer. All donations raised will go directly to supporting their lifesaving initiatives into developing medicines and personalised treatments for the 625 Australian children diagnosed with cancer each year. Now is the perfect time to get your child reading while providing vital support to hundreds of Australian children and their families impacted by childhood cancer. Already an ABC Reading Eggs subscriber? Register your participation here and follow the prompts to set up your child’s fundraising page. New to ABC Reading Eggs? Claim your 5 week FREE trial here and follow the prompts to register your child’s participation in the Read-To-Cure Challenge. For more information, simply visit http://readingeggs2014.gofundraise.com.au/. Have fun! *To link your fundraising page with your Facebook, once you have registered your child for the Challenge, please log in to your GoFundraise account, select ‘My Profile’ under ‘My Account’, click the ‘Facebook Connect’ tab and follow the prompts.